The schedule includes over 120 speakers from the growing crypto industry including; BITSHARES, the BITCOIN FOUNDATION, LITECOIN and CEO of WAX together with the launch of the latest decentralized currency exchange, SUPERSONICEX providing the opportunity to learn more about the future of the blockchain technology as well as regulatory developments in crypto affecting the industry as a whole. The three-day event will take place at the Aria Hotel in Las Vegas with registration opening at 11am on October 31, marking the 10th anniversary of Satoshi Nakamoto’s Bitcoin white-paper and serving as a reminder that One Single Bitcoin on 31st October 2016 was worth only $530 and today, only 24 months later, is worth over $6,300 per coin! 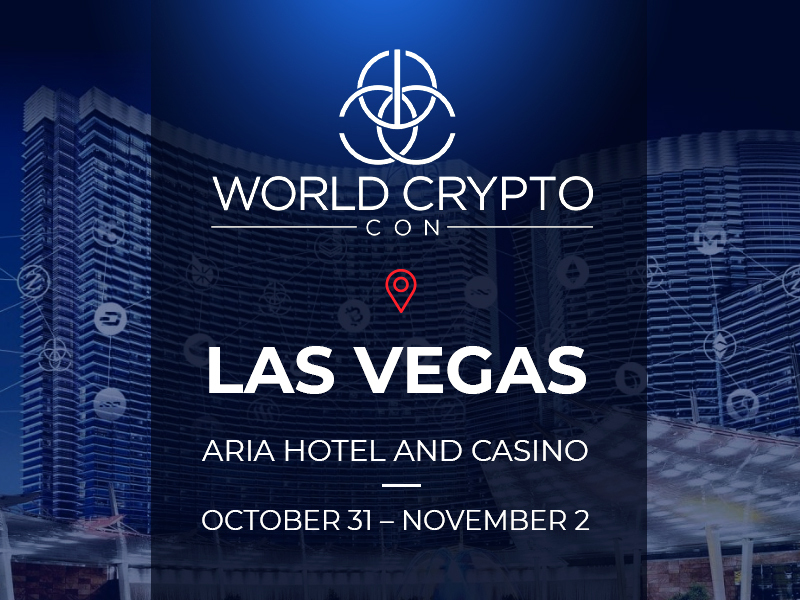 World Crypto Con delivers a global stage hosted by Stewart Rogers, VentureBeat’s Director of Marketing Technology, along with Joel Comm and Travis Wright of The Bad Crypto Podcast, and will offer the chance to meet and greet some of the industry’s biggest names. “World Crypto Con is a huge event covering over 200,000 square feet and over 120 guest speakers. It’s different to other blockchain and crypto events, as it’s not just about networking with industry peers or listening the latest regulatory trends, World Crypto Con goes far beyond that. This event offers an engaging and interactive experience joining together a community and place to immerse the way technology is actually changing the world” said Adam Williams, Co-founder of World Crypto Con. Decent.bet has teamed with WCC to host an interactive Blockchain Poker Tournament. Crypto and poker enthusiasts will have an opportunity to play with some of the biggest stars in poker. Provides future blockchain entrepreneurs with a global stage for their research. Six university teams will present their cutting-edge blockchain research and projects to conference attendees. World Crypto Con is the first Conference to bring experienced professionals from the world’s most innovative mining-related companies to create a one-of-a-kind mining experience that will drive mining innovation. Crypto artist and filmmaker VESA will be showcasing his innovative mixed media platform Art For Crypto, which is rapidly establishing new creative standards in the blockchain art space. WCC is throwing a massive Halloween celebration with the first annual CryptOween costume party at OMNIA Nightclub at Caesars Palace. The event will be DJ’d by Grammy nominee Steve Aoki and there will be a costume contest with a $1,000 cash or crypto prize for the lucky winner. Other exclusive conference experiences on the agenda include Blockchain eRacing, YouTube Influencer Meet & Greet, and Monster Security Token (STO) Event. Headline speakers include the biggest names in crypto-currency, including Brock Pierce, Chairman of the Bitcoin Foundation, Charlie Lee, Founder of Litecoin, Charlie Shrem, Crypto Pioneer and Founder of the Bitcoin Foundation. These together with Bobby Lee, Founder of BTCC, Vinny Lingham, the CEO of Civic, Ronnie Moas, Founder of Standpoint Research and over 100 more industry titans and over 150 exhibitors make this an event not be missed! There will be major industry announcements on the WCC stage, giving attendees the opportunity to hear first hand, latest new and trading tips in blockchain technology. Finally, World Crypto Con has teamed up with SuperSonicEx and is offering a whopping 50% off ticket prices, to register visit www.worldcryptocon.com and use the promo code SUPERSONIC50.